This painting was commissioned by Senor Golfer. Winnie Palmer saw it and bought it as a Christams gift for Arnold. I recaall my wife sying,"it's Winnie Palmer on the phone. After I caught my breath, we had a wonderful talk and the painting was on its way to the Palmers. Arnold said,"When I saw this painting, my eyes misted and I felt a lump climb into my throat. 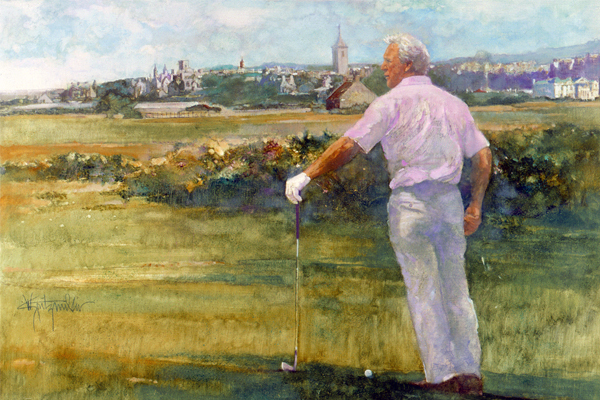 Not only did Walt capture the landscape of St. Andrews perfectly, but you can almost feel the wind and hear the sea when you stare at it. I also think his image of me captures all of the feelings I have whenever I visit the linksland. The beauty of the setting is, to me, the essence of golf. I think Walt did a wonderful job capturing that beauty and my admiration for it."